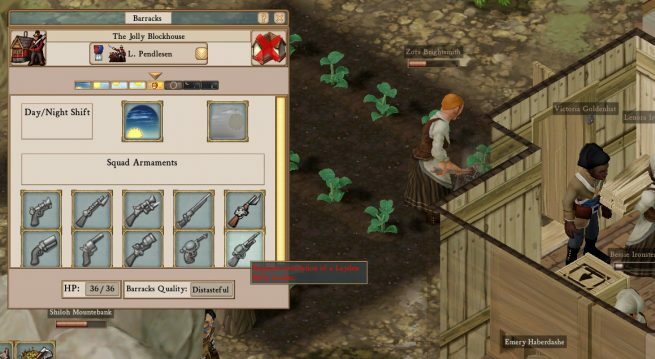 Those of you enjoying Science on the experimental branch of the Clockwork Empires beta may have noticed certain radical changes in the operation of the Barracks. Let’s talk about it! To followup gently on last week’s post about the workshift system – and the theme of removing an unnecessary choice for which there was always a right answer – the Barracks has received a shift control button. Wait, you say, didn’t you want to remove shift controls because it was an unnecessary choice for which there was always a right answer? Yes! But the Barracks is the one case where shift controls are absolutely needed. UI is meant to be functional at this point and will receive polish, so I don’t want to hear about it! Your colony needs to be able to have active soldiers at all times. But soldiers need time off to eat and sleep (unless they’re robots?). So we need to break this into the most elegant choice possible: day shift or night shift. Then you need two Barracks, one on day shift, one on night shift, to ensure basic defense coverage. And we put this control in the Barracks UI itself rather than baked into the workshift indicator because it’s a heck of a lot simpler and it reinforces the on-map Barracks structure as the control point for the squad. Note as well the solid block of on-shift time vs. the usual tea time / sleep time of civilian crews. So where do weapons go? The player should be able to control what weapons soldiers use, and this should offer a choice of firepower vs. range vs. supply use, or something along those lines. Higher level weapons should encourage and reward progress through the production chain and tech-tree. So how about point one, choosing what weapon soldiers use? Not quite as straightforward. Just a happy little shootout. Until now we’ve been tracking weapons as unique individual objects, much in the tradition of Dwarf Fortress. This introduces some bruising the fat-type problems. For instance, if you want your five soldiers to use muskets but you only have four muskets, what does the last fellow do? Use fists? Perhaps fall back dynamically to a series of pre-set contingency options painstakingly defined by the player via a tabbed loadout design UI, bristling with tooltips of the finest craftswarfship? If weapons are tracked as individual objects, what happens if your soldier drops their gun in the woods? Does someone have to go fetch it? 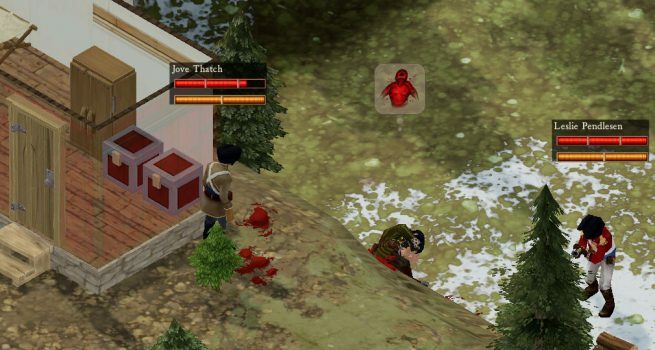 That could cost an entire work-shift worth of a civilian’s labour, significantly and invisibly hurting productivity without feedback to the player. What happens if a weapon takes damage and is destroyed without notifying the player? Then your five soldiers are down to three muskets, and you don’t know why. Or maybe you’re spammed by alerts that your musket broke. Which case is less annoying? So the question could be phrased as: Is this an RPG or is it a citybuilder? What level of attention and control is appropriate for the player to have in all of this with the context of the rest of the game to keep in mind? I shall suggest that the correct scope is to take a step back. Instead of the player minding weapons per-soldier, they should mind them per-squad, and attach this mechanic to the Barracks itself, which is the in-world control-point for that squad, just like with the squad shift-selection. So: you build a weapons locker which represents a pile of guns and all the logistical doodads thereof sufficient to equip a squad with that type of weapon. Set that up as a module in a Barracks. 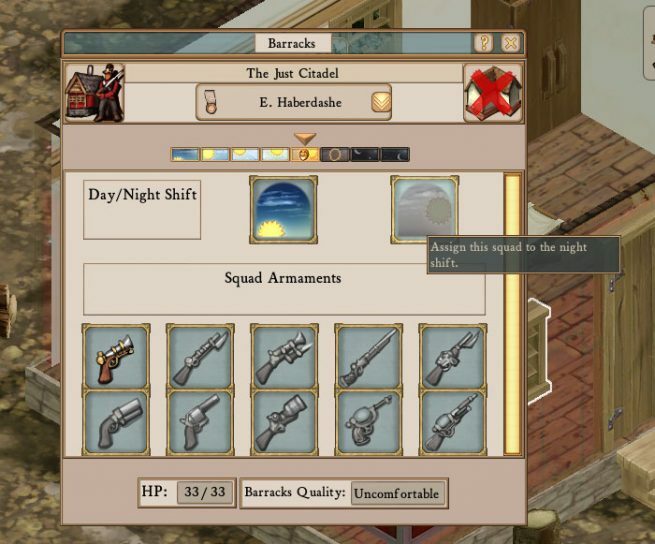 Now the Barracks allows you to select that weapon type as a loadout for the squad assigned to the Barracks. Sorry, no electrical rifles until you somehow acquire that weapons locker. This all builds on and reinforces existing game mechanics. This makes the Barracks structure itself more important (you certainly don’t want bandits destroying your weapon lockers now!). This allows the player set policy on the workcrew/squad level of granularity which we’ve been pushing as the primary focal point throughout the civilian side of the game as well. There are clear rewards for progression through now-complementary game systems, industry and tech. There’s polish to do and a few more mechanics to roll in, but it’s much cleaner now – and gives much greater control to the player in the ways that matter. Happy hunting! Managing multiple squads is easier, though sadly no more equipping the NCO only with a long weapon so they hang back while everyone else charges into gunfire or coral clubs. … This may be a simple? matter of doing an AI tweak. Seems like officers should be able to have a different weapon than the grunts, anyway. NCO’s shouldn’t be hanging back with long weapons – they should be leading the slaughter. If it ends up being an AI tweak one idea to determine if they charge or hang back could be based on their traits. Thus a foolhardy NCO is going to run right into the middle of a fight, while others will hang back. That is a far, far better solution. Good work. Now I don’t feel weird for rushing that second barracks!